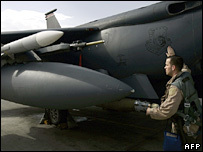 Nato is considering the use of smaller bombs in Afghanistan to try to curb the rising number of civilians killed during operations against the Taleban. Commanders have also ordered troops to hold off attacking militants in some situations where civilians are at risk. 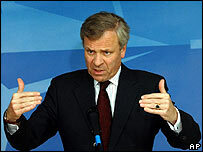 Secretary-General Jaap de Hoop Scheffer acknowledged civilian casualties had hurt the alliance politically, in an interview with the Financial Times. Aid agencies say Western forces have killed 230 civilians so far this year. Between 700 and 1,000 civilians were killed by both sides during 2006, according to the Agency Co-ordinating Body for Afghan Relief (ACBAR). Mr de Hoop Scheffer said Nato commanders were "working with weapon loads on aircraft to reduce collateral damage". However, he insisted it was impossible to eliminate non-combatant deaths entirely. Mr de Hoop Scheffer said Gen Dan McNeill, the commander of the Nato force in Afghanistan, Isaf, had also instructed troops to delay attacks on Taleban fighters if civilians are at risk. "If that means going after a Taleban not on Wednesday but on Thursday, we will get him then." A spokesman for the Nato-led International Security Assistance Force (Isaf) told the BBC's correspondent in Kabul, Alastair Leithead, that the secretary-general's comments were part of a move to revise procedures to take Afghan sensitivities into account. Mr de Hoop Scheffer's comments come a week after Italian Foreign Minister Massimo D'Alema said civilian casualties were "not acceptable on a moral level" and "disastrous on a political level". Afghanistan's President, Hamid Karzai, also recently warned Western troops against treating Afghan lives cheaply. He is scheduled to visit the US at the weekend for talks with top US officials. Our correspondent says US forces operating outside Nato have come in for even heavier criticism over Afghan civilian casualties. He says there is a feeling in the international community that the relationship with the Afghan people will continue to deteriorate unless US forces adopt a policy similar to Nato's. Meanwhile, suspected Taleban rebels in Afghanistan have killed more than 20 people in attacks across the country. Officials say 13 private security guards were killed in an ambush in the southern province of Zabul. Nine policemen were killed in two separate attacks in Ghazni in the east and Nimruz in the west.